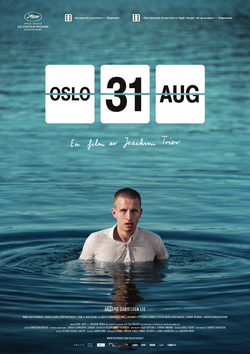 Oslo, August 31st (Norwegian: Oslo, 31. august) is a 2011 Norwegian drama film directed by Joachim Trier. It is loosely based on the novel Will O' the Wisp by Pierre Drieu La Rochelle. It premiered in the Un Certain Regard section at the 2011 Cannes Film Festival. It won the Best Film and Best Cinematography awards at the 2011 Stockholm International Film Festival, where jury president Whit Stillman called the film "a perfectly painted portrait of a generation". It received widespread critical acclaim, and was one of three films on the Norwegian shortlist for submissions to the 84th Academy Awards for Best Foreign Language Film. Anders is a recovering drug addict in an Oslo rehab clinic. On his first opportunity to take an overnight trip from the rehab centre, he meets an old girlfriend and then attempts suicide by filling his pockets and walking into a river. Unable to go through with it, he returns back to the rehab centre, where he does not mention his suicide attempt in group therapy. On 30 August, he is given a day's leave to attend a job interview in the city centre. He goes to visit his friend Thomas and his wife Rebecca and their two children. While there, he admits that after meeting his old girlfriend Malin, he felt nothing, which Thomas tries to play off. Anders slowly reveals to him that he is having suicidal thoughts. At 34 years of age, he feels he is too old to start over and is unenthused about the interview as an editorial assistant that he is applying for. He sees Thomas as being happy, but Thomas talks about his own difficulties in life including being too tired to maintain passion with his wife, having limited time to focus on his career, and the lack of true friendships as he gets older. The two part on good terms and Thomas begs Anders not to do anything terrible but not before inviting him to a party held by their mutual friend Mirjam. Anders goes to his job interview, but beforehand calls the girlfriend he was dating while he was on drugs, Iselin, and getting her voicemail, begs her to call him back. At the job interview, when he is asked about the gaps in his resume, Anders admits to being a former drug addict, causing the interviewer to grow uncomfortable. Anders abruptly ends the interview, taking his application with him and throwing it out. Following his interview, Anders has plans to meet with his sister, Nina, but is surprised and angry when Nina's girlfriend, Tove, shows up instead, eventually admitting that Nina does not want to see him and finds it difficult he is being let out of rehab. Tove is supposed to go with Anders to the family home, which is being sold to pay for his rehab, but Anders refuses to let her accompany him and takes the keys and leaves alone instead. Anders goes to Mirjam's party hoping to meet Thomas. Instead, he runs into old friends unaware of his recent sobriety, and quickly breaks it by drinking at the party. The party is Mirjam's birthday and they eventually have a conversation about how difficult Mirjam finds ageing as all her female friends have children and her male friends are dating increasingly younger women. To comfort her, Anders gives her a lingering kiss, which makes things awkward between them. Anders retreats to a room alone and again calls Iselin, leaving a message on her voicemail wondering if she still loves him and hinting that he would like to get back together with her. He then rifles through the coats and purses of the party-goers, stealing money and abruptly leaving when he is caught by Mirjam. Anders heads to his old drug dealer's place where he buys a gram of heroin. He then meets up at a bar with a friend of his and two pretty young women who are still in school. At the bar, Anders sees a man staring at him who he realizes is a man who Iselin cheated on him with. Before leaving, Anders tells him he forgives him, but the man is instead angry at him, telling him that the way he treated Iselin while they were dating was cruel. Anders and the group party well into the morning, getting drunk, making out, and eventually going to a local pool which they realize is about to be shut down as it is the last day of August. The others go swimming while Anders refuses to join them. Anders finally goes to his family home where everything is in disarray, about to be packed up. He finally calls Iselin one last time and apologizes for bothering her, telling her that he did not mean anything he had previously said. He retreats to his childhood bedroom where he shoots up. Oslo, August 31st has received widespread critical acclaim from both film critics and audiences. Review aggregator site Rotten Tomatoes reports that 97% of critics have given the film a positive review, based on 63 reviews with an average rating of 8.3/10. The general consensus being: "An upfront study of a drug addict confronting his demons, Oslo, August 31st makes this dark journey worthwhile with fantastic directing and equally fantastic acting." Metacritic, which assigns a weighted average score out of 100 to reviews from mainstream critics, reports the film has a score of 84. Roger Ebert of the Chicago Sun-Times gave the film four out of four stars and said the film is "quietly, profoundly, one of the most observant and sympathetic films I've seen". Ebert went on to name it the ninth best film of the year in his annual list. ^ "Festival de Cannes: Official Selection". Cannes. Retrieved 16 April 2011. ^ "Cannes film festival 2011: The full lineup". guardian.co.uk. London. 14 April 2011. Retrieved 16 April 2011. ^ Dawtrey, Adam (20 November 2011). "'Oslo' tops Stockholm fest". Variety. Retrieved 21 November 2011. ^ "Norway names three Oscar candidates". norwegianfilms. Archived from the original on 12 January 2013. Retrieved 18 August 2011. ^ "Oslo, August 31". rogerebert. 29 August 2012. Retrieved 1 January 2013. ^ Ebert, Roger. "Ebert's Top Movies of 2012". Chicago Sun-Times. Retrieved 18 September 2013. This page was last edited on 12 April 2019, at 23:30 (UTC).